At Redeemer by the Sea, we are BLESSED with so many gifted and talented leaders. We have on our Church Council and Board of Elders such a variety of life experience and skills; everything from military to corporate, education to government, and sales to service is represented! But perhaps what is most encouraging is not the diversity that everyone brings, but the common goals that unite us. Regardless of background, what everyone shares is a passion for God’s people and a love of our community! We recognize though, that it is easy to pit those two things (passion for God’s people, and love of our community) against each other – focusing on one at the expense of the other. This is something we do not want to do. We have been studying Christian Discipleship the last couple months during our “Best is Yet to Come” series, so we are keenly aware of the importance of gathering in community for prayer, encouragement and growth. But we are also reminded of Jesus words from Matthew 20:28 that, “the Son of Man came not to be served, but to serve,” and from Luke 19:10, that He came “to Seek and Save the Lost.” As God’s people, we must gather together and build up the Body of Christ, but we cannot only gather and build up. Otherwise, we are like the marathoner who only carbo-loads, but never runs. The image is simple, but glaring! We gather as Church to be equipped for service – not to sit and soak, but to build up for the purpose of reaching out. That was the focus of this year’s Vision Retreat. On October 25-26 our Church Council and Board of Elders met to discuss how we could both disciple the saved and reach the lost. Even the shape of our retreat followed the build-up – then work model! We met with spouses at the Burkholder residence on Friday and enjoyed a relaxing evening of community around conversation and food. Then on Saturday from 8am to 3pm we worked hard on the Kingdom tasks that God has put before us – seeking His heart for the future of our congregation. We focused our efforts on two areas that God has put on my heart as pastor recently: 1. 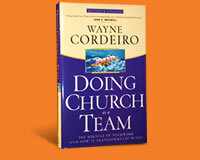 The book “Doing Church as a Team” by Wayne Cordiero. And 2. The focus of two conferences that I attended recently which were both on the same theme: reaching and saving the lost. There is a definite trend in our churches today to recognize that ministry 1. Cannot be from the “top down.” There is just too much work to do to leave it to the leaders and the professionals. And 2. We can get so inward focused in our ministry that we are effectively of no value to our community. So at the vision retreat we asked two big questions: How can we mobilize more of our church into active discipleship and ministry? And would the community around our church miss us if we were not here? We worked through the book chapter by chapter, with each member of the Board leading the discussion on a chapter, and we then worked on a strategic planning process that guided us all the way from how our congregation began to where we are today. We reviewed our mission, core values and strategy of Worship, Grow & Serve, and we asked the questions: Where are we now? Where are we headed? What’s Important Now? What structure and activity is necessary to accomplish those things? And what must change in order to accomplish those objectives? The outcomes of the process will be shared in more detail soon. However, the upshot of the event is that we recognize that we need to nurture our existing members as disciples of Jesus, but we must also do a much better job at reaching our community for Jesus. We have a good means to that nurture and growth with our Growth Groups. But in 2014 we plan to do a much better job of training small group leaders and starting new groups as well as asking our small groups to work on service projects together, in addition to their study and fellowship. Also in 2014, we will establish a task force to actively study and poll our community to determine what needs exist that we can best serve. We don’t want to be so “heavenly minded that we are of no earthly good,” as they say! Our local government, community agencies, schools – and even our own preschool – are well aware of the hurts, pains and struggles that are going on behind the doors of our beautiful homes, manicured landscapes and community spaces. Finally, we will improve some logistics and administration items in 2014 that affect our growing Sunday School, as well as our internal communications. Whatever we do in the New Year, we will be sure that we do not do alone; we must “Do Church as a Team!” Working together, we can accomplish more for God’s Kingdom than we could ever accomplish alone. Please begin to pray how God will use you in 2014 to help Redeemer by the Sea seek and save the lost. And please pray that there will be more souls in heaven on the Last Day because of what we do today!